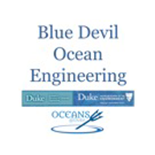 Students and Faculty from Duke University Pratt School of Engineering and The Nicholas School of the Environment have formed a team based around classes in Ocean Engineering and Robotics and a Student Club. Our entry uses heavy lift UAVs or drones to drop SONAR pods across the ocean for mapping the 3D volume around the pods as they drop and resurface to be retrieved by the Drones. We feel that the mapping the 3D volume of the ocean is just as important as mapping the ocean bottom. The Duke University team is working with heavy lift aerial drones that drop retrievable diving SONAR pods.